Random tidbit in last month's Real Simple magazine. 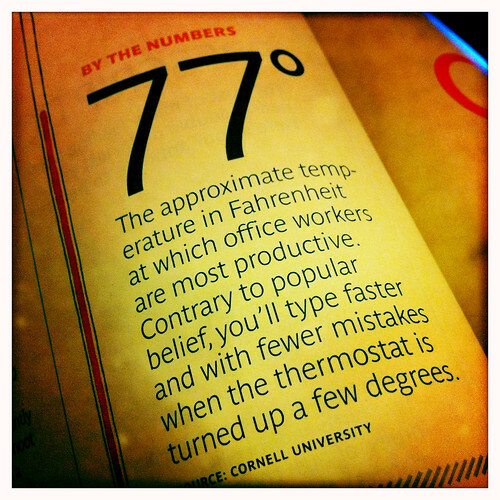 Temperature is a harrowing topic at my workplace. Here are the top 3 "heated" discussions we discuss when we discuss things in a heated discussory manner. 1. Dirty dishes left in the sink. There's some sort of regressive childhood disorder going on here. I blame doting mothers. 2. Coffee comparable to brake fluid. It's not good. You can pretend it is, but it's not. I will choose the high road on the brand, but it rhymes with Loyal Pup. 3. Talking in the hall outside someone's office. Guilty. My personal work pet peeve: Entering the restroom immediately after someone else has taken care of some profound business. I work quickly to exit before someone enters and blames me for the assault on the senses. Is that just me? For the record: This gal with the muffin top is always freezing. What's your work drama? PDA, disappearing staplers, keyed cars?